I made a new video: Spinning around the world. Often, you see me sitting on a stone somewhere in a Swedish fairytale forest. In this video I will visit your forests. The video was shot in the Edvard Anderson conservatory at the Bergius botanical garden in Stockholm, Sweden. Edvard Anderson (b. 1865) donated his fortune to the Bergius Gardens for a conservatory of Mediterranean plants that the people of Stockholm could enjoy all year round. He also wanted a café in the conservatory, selling coffee, soft drinks, chocolates and pastries. The conservatory opened in 1995 and we have had season tickets since then. Our son was born in 2003 and he was baptized in the entrance pond which is seen at the beginning of the video. The conservatory is built up of seven different climate regions with the main hall dedicated to Mediterranean plants. Six smaller halls contain plants from tropical and sub tropical rain forests, tropical ferns, deserts and the area in south western Australia. I shot short clips in all of the halls, except for the Australia hall – there was nowhere to sit or place my tripod. In the tropical hall there was also a fiber section with fiber and dye plants – ramie, New Zealand flax, different kinds of cotton, Indigo, Chinese Indigo and paper mulberry. Lots of cotton wads were hanging from the cotton plants, enticing me with their squishiness. I asked one of the gardeners what they were doing with the cotton. I figured that if they harvested it and didn’t know what to do with it, I could adopt some of it and spin it. The answer was that they didn’t do anything with it – everything was supposed to have its natural cycle. Hence, they let everything fall to the forest floor and contribute to the natural cycle of the forest. Which of course was reasonable and logic – no cotton for me. 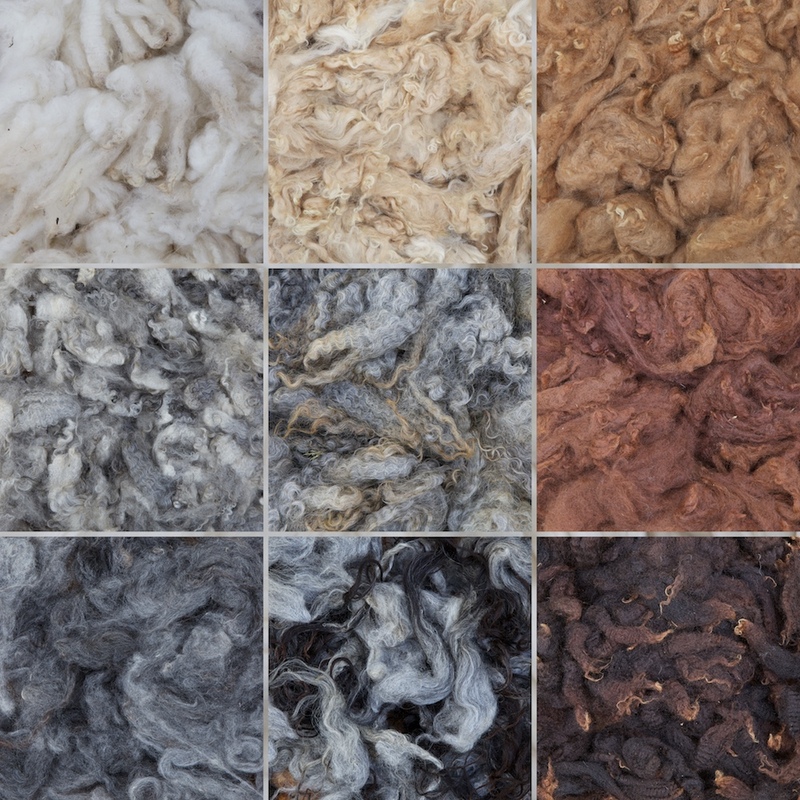 The wool I chose for this video is a beautiful shiny white lamb rya. Last August I participated in a live spinning competition. The contestants prepared and spun singles from the same wool in front of an audience for 30 minutes on spindles or wheels. The wool was this rya and we all got about 50 grams each of it. Quite generous, since I only combed three bird’s nests and spun two of them in the competition. I had nearly forgot that I had brought the rest of it home. I am planning to do some embroidery and I figured this Rya would be a perfect candidate for my embroidery yarn. I combed the fiber and made beautiful bird’s nests, almost too pretty to spin. Long rya is not the easiest fiber to spin on a supported spindle. The fibers are very long and sleek. This means that you have to keep a good distance between the hands to be able to draft. This is not always easy. But, as with all spinning, you have to get to know the fiber before you can spin it to its full potential. Thank you for all your kind words about my blog and videos. You are my biggest source of inspiration! A finished skein of Rya yarn, spun and 2-plied on a supported spindle. 101 m and 46 g, 2207 m/kg. Since I started spinning with in-hand spindles and distaff in the beginning of the year, I have wanted to make a medieval style spinning video. I did actually make a short video in the cold winter, but it was a great challenge to work with cold lanolin and stiff hands. I realized that I had to wait for spring to make a proper video. While waiting for spring to happen, I talked to my friend Maria. She is a medieval enthusiast and reenactor of epic proportions. She is also one half of Historical textiles and a mean plant dyer and weaver. I asked her if she was willing to help me with the videography and contemporary costume and she was happy to do it. We synced our calendars and decided on a date to shoot the medieval video. Lucky for us, the agreed occasion turned out to be a beautiful spring day. It was also quite windy, which made our dresses and wimples ripple flatteringly in the wind. Maria came with a huge backpack filled with medieval clothing, all hand sewn by her. Everything else was also hand made – wool combs, belt, hair pins, wimple pins and shoes. It was such an honour to wear all these hand made treasures. I got a sturdy hand woven linen robe (which doesn’t show) and on top of that an indigo dyed woolen dress. An intricately arranged linen headdress, a hand woven belt and hand made shoes. I added the string with spindle whorls. Despite the warm weather, the clothing felt quite airy and comfortable and I never got too hot (or a sun burn). That’s natural materials for ya! Maria says the costume dates to the high fashion of the 1360’s in today’s Northern Germany or Scandinavia. Woolen dress (with a linen robe underneath) and linen wimple. Photo by Dan Waltin. We shot the whole video in a nearby forest. The thinly leather soled shoes were very smooth and it was a challenge to get around in the slopes of the forest without slipping. It was not that kind of video I was looking for. I also got a severe thigh rash. Medieval women must have had very thick inner thigh skin. Or perhaps they didn’t have hearty biker thighs. As we walked to and from the set, we met lots of Saturday strollers. In the typical Stockholm way (never, never, ever stare at or comment on anything out of the ordinary, just roll your eyes when you are sure no one can see you), many people passed us without any comment, but a few people did stop to ask us about what we were up to. They were curious about our costumes, how they were made, when they were from etc. Some people asked if we were nuns. Maria explained that we were regular people from the time around 1360. Nuns dressed in the latest fashion, so this is how they dressed back then. They have just stuck with that fashion ever since, at least the Bridgettines. In the video, I spin on spindles from Hershey fiber arts and NiddyNoddyUK. They both have spiral notched tips. The whorls on the spindles are from Pallia. On the leather string in my belt you can see additional whorls from Pallia, John Rizzi and Hershey fiber arts. Both distaffs are my own hand carved. On the belt distaff I have arranged hand carded wool from a prize winning Värmland fleece (just like in this video) and on the hand distaff there is hand carded comb leftovers from Shetland sheep. When I spin on a medieval style in-hand spindle, I tend to start by using a proper in-hand style and not let go of the spindle. When I feel I have enough twist, I let go of the spindle and use a very short suspension and let the tip of the spindle rest against my thumb. This way I can grab the spindle quickly whenever I need to. If I use a hand distaff I usually keep the yarn straight by moving my distaff hand away from the spindle. If I use a belt distaff I tend to wrap the yarn onto my distaff hand to keep the yarn from slacking and still hold the spindle in a comfortable position. You can see both these techniques in the video. In-hand spinning with a hand distaff. In my latest in-hand spinning video, someone asked me if I’m drafting with my left (fiber) hand or if I’m just pulling with my right (spinning) hand. When I spin with a hand distaff, there isn’t much room for the fingers to draft. But even with a belt distaff, I’m not drafting very much. I just let the fibers settle themselves in the twist with the draft of my spindle hand. That usually works just fine when I have prepared the fleece myself (which I usually do) and left just the right amount of lanolin in it to assist my drafting. Perhaps I would use my fiber hand for drafting if I were to use a short draw. I haven’t tried that yet, though. 3-ply yarn spun on a medieval style spindle and distaff from hand carded batts. 49 g, 97 m, 1981 m/kg. Soft and fluffy as a cloud. Spindle shafts and whorls from Hershey fiber arts and John Rizzi. I hope you enjoy the video. I (we) certainly enjoyed making it.